Anti-desiccant Sprays – a Good Idea? The arrival of winter can be a time of concern for growers of evergreens. Unlike deciduous plants, our evergreens remain, well, evergreen, so their foliage is exposed to the cold, harsh winds of winter, especially during storms. When spring comes, and we find brown, dead patches and branches, this is often put down to low temperature, but that is not really true. ‘Winter-burn’, or ‘desiccation injury’, as this condition is known, is caused not the branches becoming cold – evergreens are well adapted to low temperature, as we can see when climbing mountains or heading north. As we enter colder and colder areas, it is the evergreens, like spruce or fir, that persist, as the deciduous trees disappear. So if it is not cold, what exactly is the problem? Put simply, there is an imbalance between the amount of water lost from the foliage, and the amount absorbed at the roots. A lack of water in the leaves, aggravated by dry air and a strong wind, causes the foliage to dry out, and of course it dies. Where cold comes in is in the roots. Although the soil may be wet, once that water freezes, it cannot be taken up by plants. In a nutshell, this is the fundamental problem, and why you may have a sad face in spring when you see your plants. Water your evergreens heavily just before freeze-up. This will slow down hard freezing, and hopefully leave some free water available for your plants. This should always be done, no matter what additional protection you provide. Mulch the ground over the roots. The deeper levels of the soil don’t freeze, and they contain a lot of warmth. A mulch will insulate the roots, keeping the cold away and allowing that deep warmth to rise and prevent the soil from freezing. Even if the ground does eventually freeze in the depths of winter, it will be for a shorter time, so there is less chance of the foliage losing a lot of water, and a better chance it will stay alive. Wrap the trees in burlap to slow down the wind. Reducing wind flow over and through your plants reduces the rate of water loss, and often prevents winter burn. Wrapping can have a secondary benefit in preventing salt-spray damage, but only if there is a space between the burlap and the trees. If not, the salty water will be held against the foliage, and the problem may be magnified. Wrap trees in netting. This has the advantage of being much less visible, and has been shown to be almost as effective as burlap. It is especially useful for specimens, but even a hedge could be netting, with a little effort. These methods are fairly well-known, and in fact we have already discussed them in early posts. But there is another, less used method that may be not only the easiest, but the most effective approach to take. This is the coating of the foliage in materials that slow-down or prevent water loss from the leaves, and so protects them very effectively from winter-burn. These anti-desiccants have been used by professionals for a couple of decades, but they have not been adopted much by home gardeners. This is a pity. They have lots of other uses around the garden, that we will look at later. Here though, we are primarily interested in their use specifically for evergreens, especially in the first winter or two after planting. These are the times when plants are most susceptible to winter-burn. Once the roots are well-established, they are more efficient at keeping up a sufficient water supply to the roots, and well-established plants are not likely to suffer from winter-burn. A heavy watering and some mulch is all they need. 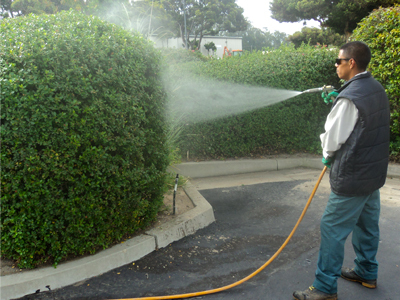 There are several products available, with names such as Wilt-Pruf, Wilt-Stop, and ArborGuard. All contain the same ingredient – a natural chemical extracted from pine trees, called ‘pinene’. This material, when mixed with water, forms a natural polymer. That is to say, the molecules link together to form a plastic-like coating over the foliage of your plants. This coating slows down water loss, reducing and preventing winter-burn and desiccation injury in plants. Since this product is organic and natural, you do not need to worry that you are adding harmful or dangerous chemicals to your garden environment. There are several ways to buy this product, but for anything other than a single small plant, the best approach is to buy a concentrate containing at least 25% pinene. This is diluted with water, and using a sprayer, applied to the plant until it drips off a little. At first your plants will look bluish-white, but once the spray dries it is completely transparent. You won’t have ugly burlap to look at, and no complicated staking and tying operations to do in the cold, either. Always follow the label instructions carefully. Choose the correct dilution rate for the time of year, and your purpose. These sprays work best if applied when temperatures are around 40-50 degrees F. The plants should be dry when you apply it, and the spray needs time to dry afterward, so don’t spray when rain is expected in the next few hours. Wait until December to spray your evergreens, or late November in the coldest areas. Plants must be completely dormant before applying, or else the spray will trap too much water in the leaves. This may then freeze and cause the leaf-cells to rupture, causing browning. When plants stop growing completely, the water in the leaves is reduced, so this problem will not happen once the plants are completely at rest. Spray thoroughly, all over the plants, from top to bottom, including the underside of the leaves. Plants lose water from both the upper side and under side of the leaves, so you need to seal the whole plant. If there are warm spells later in winter, take advantage of the temperatures being above freezing, and apply another coat. It does gradually wear off, and after a month or two it is not so effective. This is another reason for waiting as late as possible, and for re-applying once a month if you can. Besides Arborvitae and other conifer-type evergreens, these sprays are very useful for boxwood, rhododendrons, holly and other broad-leaf evergreens growing in cold areas. They have even shown a benefit for climbing roses and hydrangeas, again when growing at the limits of their hardiness. One last tip – blue spruce is very hardy, and rarely suffers winter-burn. However don’t be tempted to spray them, as they have their own natural coating, which also gives them their blue color. Spraying will damage that, and make them unsightly. When Is the Best Time to Plant Thuja Green Giant? 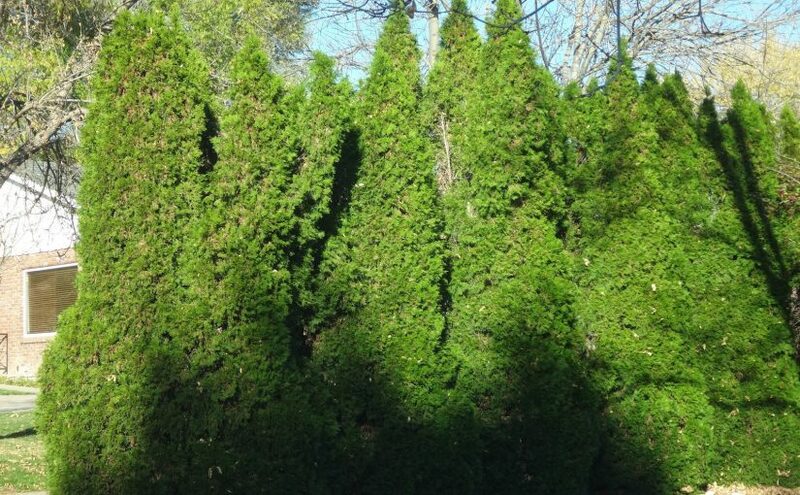 This is one of the most common questions about Thuja Green Giant. There was a time when hedging plants were only available at certain seasons, because that was when the growers found it best to dig the plants from the fields. Today even large trees and bushes are grown entirely in containers, so they are available for planting all year round. When you have a garden project to do, you can find the plants you want, but still, there are better and not-so-good times to plant, so let’s look at this issue with Thuja Green Giant. Hedges and screens have always been a core part of most gardens. They are cheaper and much more attractive than fences, especially if you need shelter and privacy above 6 feet high. As well, hedges are effective filters of dust and noise – much more effective than solid structures of wood, concrete or stone. Installing a hedge or boundary screen is often the first job in establishing a garden. Our goal is to put in plants so that they take hold immediately, begin to grow as soon as possible, and establish themselves quickly, growing rapidly to maturity. Since we can plant at almost any time of year that the ground is not frozen hard, deciding on which time is best for you, given your location and goals, is an important decision. Let’s look at the different options, and most importantly, consider the implications of each choice in terms of future care and the rate of establishment of your hedge or screen. Fall planting is one of the two traditional times for planting – the other being spring. As we all know too well – gardeners or not – there is early fall, with its warm days and crisp nights, and the feel of summer still lingering. Then there is late fall, when the first chill winds of winter begin to blow, and icy rain can sting your face. It is those first weeks of fall, from Labor Day onward, that are the ideal time in fall for planting. Firstly, the soil is still warm from the summer, so roots are stimulated to grow. There has usually been some rain around the end of August, when the first cooler nights arrive, so the ground is moist too. Warmth and moisture are ideal conditions for rapid root growth and establishment. Thuja Green Giant, like any other tree you plant at this time, will quickly send out roots to explore the soil you carefully prepared, and the continuing rains of fall, with cooler air temperatures, will reduce or even eliminate the need for you to water your plants. The roots of trees are adapted to grow in cooler conditions that the branches. So root growth will continue even as the soil cool. In mild areas, where the ground rarely freezes hard, some root growth will continue all winter. You can plant right up to Christmas if the ground is not frozen. By spring your plants will be well-established, and ready to take off. Not only will you see rapid growth, but water-stress will be reduced, although you will still need to water your new trees regularly during that first growing season. On the other hand, if you live in a colder area, and you delay planting until, say, Halloween or even later, then you begin to run the risk of winter damage. That small pot of soil that contains all the roots of your plants can easily freeze solid, making it harder for the leaves to take up water. The plants will be more prone to winter burn. The conclusion we can draw is that while early fall is a good planting season everywhere, late fall and early winter become less and less attractive for planting, the further into cold areas we go. Spring is the other traditional planting season for trees. Especially in cold areas, it is perhaps the better season, especially for evergreens like Thuja Green Giant. The main disadvantage to spring planting is that the soil is very cold, and often very wet as well. When saturated with water soil has very little oxygen in it, and oxygen is vital for the growth of plant roots. Some diseases thrive in very cold soil, and that cold, wet, oxygen-low soil can encourage disease and reduce growth. It follows that if you plant in spring, don’t be too eager, especially in cold areas. The ground remains cold for some weeks, and it is best to wait for it to warm and dry a little before planting evergreens. How long to wait depends on your climate zone. In areas where hot, dry summer weather arrives early, don’t wait too long, but in places where spring is a drawn-out affair, and summers are often wet and cooler, there is no hurry, and later may be better. May and early June can be ideal for evergreen planting in cold areas. Usually, though, trees planted in spring will not be so well established by summer, so you will need to keep a closer eye on watering. Don’t be fooled by a thunderstorm, which often doesn’t even penetrate the ground. If you plant in spring, you should let a hose trickle gentle near the base of each tree once a week for the first growing season. The root-ball will have few roots spreading out at first, and even if the surrounding soil is damp, warm weather creates a lot of water-loss from the foliage of your trees, and that small root-ball can dry out quickly. This is the single biggest danger for trees planted in spring – root-ball desiccation. Careful attention to watering right at the base of the tree, as well as keeping the soil generally moist, is the key to giving your new plants the best possible chance for success. Although we have had trees in pots for decades now, some gardeners still avoid summer for planting. Fair enough, but not everyone has that choice, and if you are keen to get started, and it is already June or July, there is no reason why, with the right care, trees planted in the full heat of summer will not thrive. A few tips for planting will give you the information you need to succeed. First, always water the container thoroughly the night before planting. A moist root-ball is vital. Secondly, always soak the planting hole before you finish putting back the soil. When there is still a space left in the hole, fill it with water and wait for it to drain down. There is a danger in summer especially that you will not water thoroughly enough, and the soil round your plants will still be dry. Watering right into the planting hole prevents this happening. Also, establish a regular watering schedule – twice a week during hot spells, once a week the rest of the time. Water thoroughly, using a trickle hose, rather than a sprinkler or hand-held hose. Watering by hand is fun, but we rarely stand there long enough to really do a thorough job. If you keep a close eye on watering, your plants will be well-established by fall, ready to take advantage of that season to complete their establishment. Summer planting usually give the maximum possible growth rate in the following season. Hopefully these tips and thoughts will help you decide when to plant. Even more, no matter when you plant, they will help you get the most from your trees, and soon have a great screen or hedge of Thuja Green Giant. Should Thuja Green Giant be Planted in Spring? This question is worth asking before we get down to the details of soil preparation, and it doesn’t have a simple answer. It depends a lot on where you live. If you are in the warmer zones, let’s say 7 and above, then planting in fall and early winter, while the ground is not frozen, is a smart choice. You may only have limited soil freezing, or none at all, where you are. If that is so, then you can plant all through the winter, especially if your new plants are well-established ones, coming to you in pots. The colder your winters, the more you should consider planting in spring – at least once September has passed by, since that is an excellent planting month just about anywhere. As the soil gets colder, and soon freezes hard, the risk of some winter injury increases. So in zone 5, especially if you border zone 4, then spring planting is the better option once we reach October and November. When is the Best Time to Prepare the Soil? Having settled that issue, let’s look at our main theme, which is preparing the ground for planting, whenever it is going to take place. If you do opt for spring planting, then fall is the best time to prepare the ground. You probably have much less to do in the garden, besides rake leaves, so you will put more time into getting the ground ready. Letting a dug area rest over winter is also invaluable, so rather than a hasty job while the plants sit impatiently in their pots, do your soil preparation in fall and winter. The goal of good soil preparation is to create an environment for your plants that will encourage them to send their roots far and wide. As well, we want them to find lots of tasty treats along the way, that will feed them, and develop vigorous, sturdy growth. To achieve that we want a wide, deep area of the ground dug over. For a hedge planted in a single row, an area at least 3 feet wide should be prepared. If you are planting a double row, then make the planting area 18 inches wider on both sides than the distance between the rows. As this is commonly 3 feet, the prepared area will be 6 feet wide. If you are planting individual trees, or a widely-spaced screening, then you can prepare individual holes. These should be dug 3 to 4 feet wide, even though of course the actual planting hole will be much smaller. As for the depth, most tree roots – even for large trees – are found in the top 12 inches, so ideally that should be the depth the ground is dug to. That is about the depth of a full-sized spade pushed completely down into the ground. When using a rototiller achieving this can be trickier, and we will look at that a bit further down. That takes care of the first essential – space for the roots to spread. The second goal is to improve the soil by making it drain better, and by enriching it with materials that improve its quality in the long term, while providing a steady supply of nutrients to your plants. Organic material is the ‘magic black gold’ for improving soil. Unlike fertilizers, it improves the soil itself, rather than just supplying plant nutrients. The top choice is well-rotted animal manure, from cows, sheep or horses. This is the mixture of straw and dung from sheds and stables, that has been piled up for a few months until it turns dark brown and crumbly. It has become increasingly hard to find, but garden centers often sell it in bags, or your local soil merchant may have it in bulk. In some areas there is a commercial mushroom industry, and the material used for growing mushrooms is an excellent compost. If you have your own garden and kitchen compost, that too is great. Other materials are available, different in different areas, so if you can’t find any of these, consult your local garden center for the best substitutes. Peat moss is acceptable, but low down on the list, since it has few nutrients, and can repel water when it dries. It also rots too rapidly, and the benefits are soon lost. The ‘magic’ of organic material is that whatever type of soil you have, it will be improved. In sandy soil the material will increase the ability of your soil to hold water, and give it more nutrients. In clay soil it will open larger spaces, giving you better drainage. As well, natural gums and resins will bind together the tiny clay particles into bigger clusters, allowing air and water to move more freely through the soil. In all soils the gradual decay of the organic matter will act like a slow-release fertilizer, keeping your plants growing vigorously. In some areas the soil is naturally low in phosphates, so super-phosphate or bone-meal are useful additions when preparing the ground. 5 pounds of superphosphate will be enough for a hedge area 100 feet long. Starter fertilizers for hedges, if you choose to use them, should be added, at planting time, not when preparing the soil in advance. Once you have your organic material ready, rent the largest rototiller you can for a day (or two if the hedge is going to be very long). 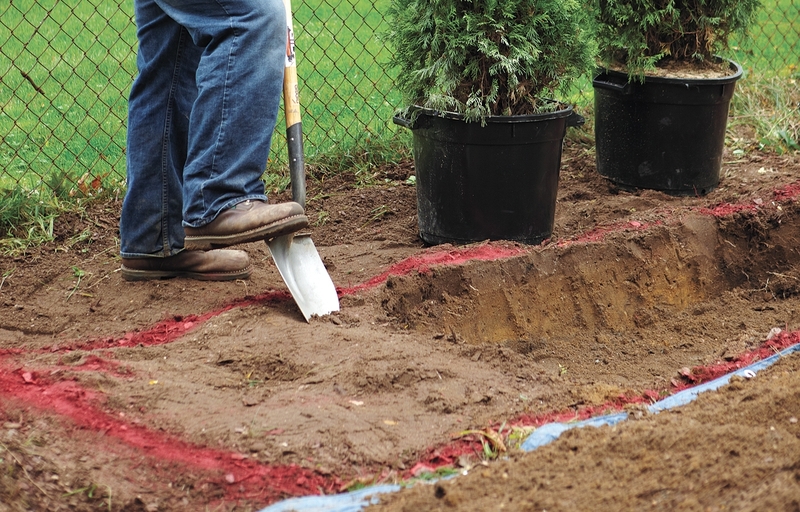 Begin by scattering that super-phosphate over the soil, it is important that it be dug into the ground, not sprinkled over the top of the area after the work is all done. Now spread the organic material at least 2 inches thick. On poor soil, you can easily double that. Dig the ground as deeply as you can. 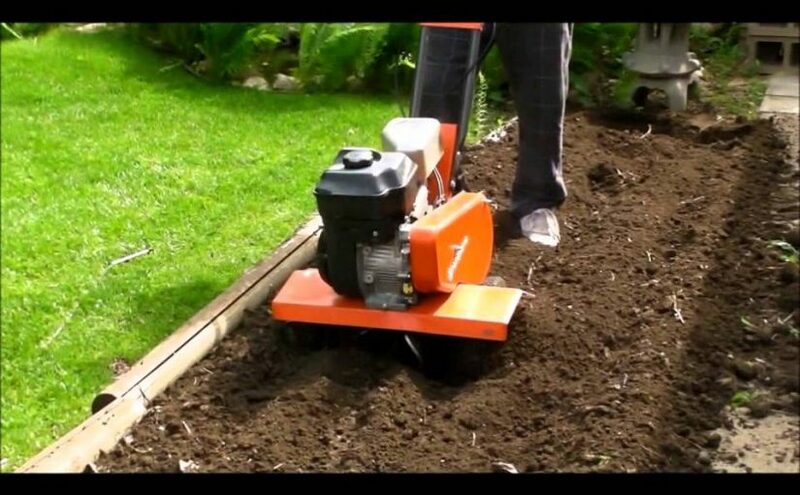 With a rototiller you may need to go over the area two or three times, working the tiller deeper each time, to get down to the full depth. The first pass over the ground might look good, but it will usually be too shallow. If you are leaving this bed until spring, leave it rough This allows the frost to penetrate, and if you have a clay soil, this will produce a better soil texture. If you are planting soon, rake it level and leave for a few days, if you can, for the ground to settle, otherwise delay raking until spring. After all this work you deserve to stand back and admire the prepared bed, ready to take your new plants. You have done a fantastic job, and the growth and health you see in your new hedge will be your reward. Well done. How Do I Plant Thuja Green Giant? Learning to grow plants is an exciting experience, but it can be scary too. We take the lives of these young plants in our hands. You set out wanting an attractive screen or hedge, but then one day a bunch of plants arrives at your door and you have to do something with them! If you aren’t used to working with plants, this suddenly becomes a nervous time. “What do I do now? Will I kill them? Help!” are common responses to this sudden crisis of confidence. If you are here, this is probably your situation. So relax. Sit down. It’s going to be fine. We will take you through all the ‘obvious’ things that aren’t so obvious to a beginner, and so always get left out of the planting guides you might already have looked at. We are going to start with the basic basics, and get those plants in the ground and ready to grow. The first thing to do is to open up the packaging or boxes your plants arrived in. They have been carefully wrapped to protect them during shipping, but now they want to be let free again. Don’t make the mistake of keeping the boxes closed up. Don’t make the mistake of leaving those boxes indoors. Even if it is cold outside, they don’t need or want to be kept warm and protected. So your first job is to unwrap them completely. Take them out of the boxes, wrapping paper, plastic bags, cardboard, or whatever else they are wrapped in. Carefully cut the tape and unwrap them – don’t try to pull them free without first cutting the wrapping. You could easily snap branches, or loosen the roots. If there is any string around the plant, cut through that and remove it completely. Makes sure you don’t leave any loops still tied on, as these could strangle the trunk or stems as the plant grows larger. Look carefully, these could be hidden by the foliage. Now take them outdoors, and place them in a sunny or brightly lit place. They have been in the dark for a few days, and they will want to re-build their reserves with the magic of photosynthesis, so they need to be in bright light or full sun. If you have room, spread them out a little, rather than packing them close together, where damp or darkness could weaken some branches, turning them yellow. While you are moving your plants outside, take a look at the soil. Do the pots feel heavy or light? If they feel light, that is a clear sign that water is needed. If they feel heavy, even if the top of the soil looks dry, they probably don’t need watering. If they feel light, or you can see a gap between the soil and the pot, then they need water right away. It is normal to ship plants when they are a little dry – they travel better that way. Now they are outside again, they need a drink. Water each pot thoroughly, so that some water runs out of the bottom of the pot. If they seem very dry, placing each pot into a bucket half full of water, and leaving it for a few minutes before taking it out again, is a good way to get them thoroughly watered. If you keep an eye on them for water, there is no hurry to plant your Thuja Green Giant. They will grow happily in the pots for days or even a few weeks, while you get the planting area prepared. In hot weather they might need water every day, so don’t neglect them at this stage, but always wait until the soil has dried a little. Preparing the ground for planting is the most important thing you can do to help your new plants become that hedge of your dreams. It is also the hardest job, and the one that takes the most time, but every minute is a worthwhile investment in the future of your plants. Dig the soil as deeply as you can. The full depth of a spade is ideal, or if you use a rototiller, go over the ground several times until it is dug as deeply as possible. Dig the whole length of your hedge, not just where the individual plants are going. If that is not possible, then prepare an area at least 3 feet across for each plant. The strip you prepare should be at least 3 feet wide. Add some organic material to the soil as you dig. This could be garden compost, animal manure, rotted leaves, peat moss, or just about anything you have. Don’t use things like bark mulch, or other woody materials, but anything else will be fine, as long as it is well-rotted. Now you have prepared the area, its planting time! This is the fun part, and if the ground has been prepared well, it won’t take long. Water the pots the night before you intend to plant, and if the ground is dry, water the planting area too. Now, place the plants where they are to go. Use a tape to measure the spacing you have chosen, which could be 3, 5 or even 8 feet, depending on your purpose, and whether you are using a single or a double row. Your hedge or screen will look so much better if the spacing is even, so don’t just eyeball it, use a tape. Dig a hole in the prepared ground the same depth as the pot, and a little wider. Since you have already prepared the ground, it doesn’t need to be very big. Mix some DIEHARD Starter Fertilizer into the soil you removed, and into the base of the planting hole. This will get your plants off to a flying start. Remove the tree from the pot, and take a sharp knife or box-cutter. You will probably see a lot of roots coiling around the root-ball, and you need to cut through some of these, so that they don’t strangle the plant in years to come, as they grow thicker. So cut from the top to the bottom of the root-ball, about one inch deep, at three places around the ball. Don’t be afraid you will hurt the trees, you won’t. Place the plant in the hole, and turn it if necessary to give you the best-looking side facing you. Adjust its position so that the top of the root-ball is about an inch above the surrounding soil level. Put back most of the soil, pressing it down with your feet as you go, until you have replaced about two-thirds of the soil. The soil should be firm. Fill the hole to the top with water, and wait until it drains away. Now put back the rest of the soil, mounding it up a little to just cover the root-ball. You don’t want the root-ball buried deeply, as this can lead to all sorts of problems for your new friends. You can give another watering if you want, but it is not essential. Put a couple of inches of mulch over the root area, or even the whole planting strip, but don’t let it touch the stem or foliage of your plants. Once you have stood back and admired your work, all you have to do now is water your new plants twice a week for the first month or two, and then once a week for the rest of the season. By next year you can move to a regular maintenance program of watering, fertilizing and trimming. With Thuja Green Giant you won’t have long to wait before your hedge is full-grown – enjoy!